It’s that time of year again when we are already well into a new year and eagerly exploring ways in which we can inject Pantone’s color of the year into our wardrobes! Pantone’s colour of the year has been reflective of the current cultural climate since the early 2000’s; each year the chosen colour has historically influenced a multitude of different design elements including interior design and food – but especially fashion. This year, however, it is clear that the yellow-green hue is representative of the environment as 2017 is set to be the year of improved sustainability. For 2017, the Pantone color of the year is Greenery. 2016 was a year of many cultural changes all over the world and Greenery represents new beginnings and fresh starts which is very fitting for 2017. The vibrancy of Greenery will be a stunning colour to wear in early spring and summer, and will help people embrace exploring different colour palettes even if only through a few select pieces. Keep reading for inspiration from the experts on how to wear Greenery in 2017! If you are someone who doesn’t enjoy wearing many colours but are interested in some cooler hues of this shade, this blouse from Nordstrom would be a good option for you. This floaty blouse can be worn casually or glammed up for a night out with the right accessories. Step away from your skinny jeans and embrace some cropped greenery trousers for a brilliant spring look that can be paired with flats, trainers or heels. From Harvey Nichols, these high waisted trousers will provide comfort and style. For a more vibrant and true to colour greenery garment, why not try this blouse from House of Fraser? The pattern is perfect for spring, too! As the cool temperatures here in the UK are likely to last for a little while longer yet, it’s definitely not time to pack away your scarves yet! This luxurious 100% cashmere scarf from John Lewis would look stunning with a cream or beige coat with some ankle boots. If statement jewellery is your thing and you love expressing your love of vibrant colours through statement pieces then this ring from Tiffany is a great option. This octagonal green quartz ring can be paired with many different green garments to make your overall outfit pop! 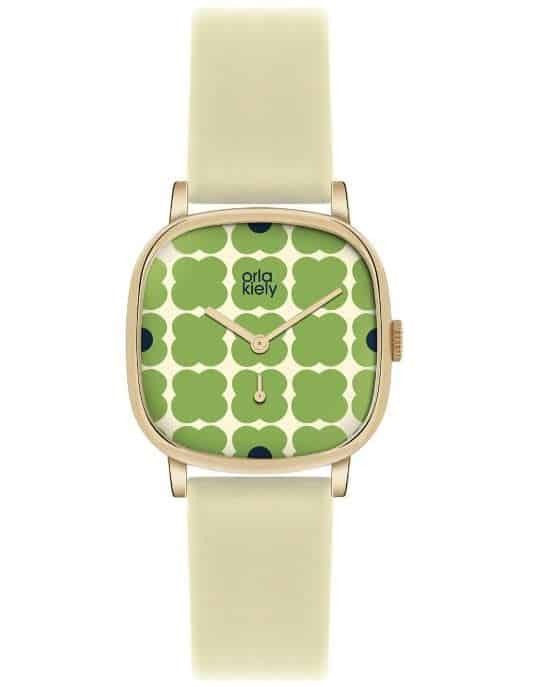 If you want to accessorise with greenery but are looking for something more quirky, this Orla Kelly watch is perfect!